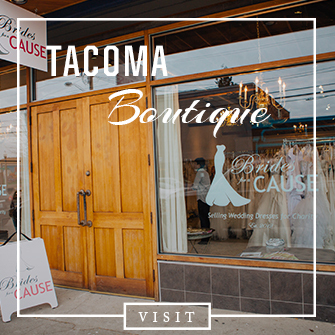 Are you interested in shopping for your wedding dress at Brides for a Cause? 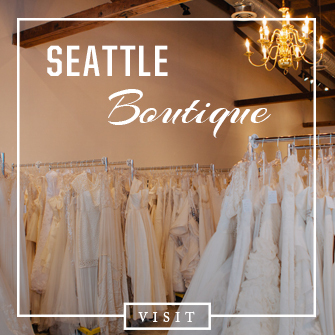 Shop at our bridal store in Portland, where you can browse through more than 500 unique wedding dresses for your special day! We’re open 7 days a week on a walk-in basis, no appointment needed! Features 2,500 sq ft of space with hundreds of discounted wedding dresses starting at $150! There’s tons of free parking on the street. There’s also several paid parking lots across the street (10th & Division) and behind our building (enter on 11th Ave). If you park in the guest parking lot in the back, please walk around the building to enter our boutique through our front doors on Division St. If it gets busy and a line starts forming for the fitting room, you may be asked to give up your fitting room while you shop for more dresses! So while you’re out looking for more dresses, another bride can be trying on dresses! The fitting room is a constant rotation as you select more dresses, so be prepared to exit your room each time as you find more dresses to try on! The bride should be the one picking out the wedding dresses! Your entourage may go through the racks with you, but we want to be sure the bride is the one pulling dresses and approving them before they go into your fitting room! Your entourage should stay with you! So if the bride is looking through the racks or picking out more dresses, your entourage is right here with you, every step of the way! So we will prohibit your family and friends from pulling more dresses from the floor while you’re still trying on dresses. We recommend keeping your guest count to a limit (1-3 people), especially on weekends. While we have 6 private stalls to try on dresses, our fitting room area for guests is a communal area, so you’ll be sharing a space with others. For those wishing to shop with a large entourage (4 or more people), please try to shop during the week or a weekend afternoon after 2pm. Our stores are busiest on weekend mornings until about 2pm, so plan accordingly! Curious about our other Locations? Shop at our Tacoma or Seattle boutique to browse completely different inventory than what’s available in Portland! Get a dress from us? Don’t forget to send us your photos after your wedding! Submit Your Wedding!